» AlpineAire vs. Mountain House: Which One Will You Like More? 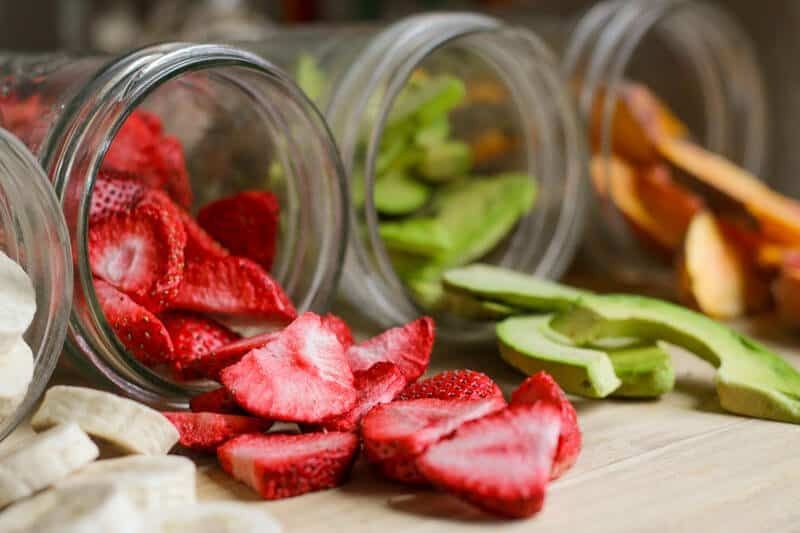 While freeze-dried and dehydrated food may not be a big part of your meals normally, anyone who’s had to pack for a backpacking, camping or hiking trip knows that these packaged, lightweight, easy-to-prepare foods are the way to go. In this article, we’re going to talk about two providers of outdoor-ready foods: AlpineAire and Mountain House. We’ll give you an overview of both companies, talk about their features and weigh their pros and cons. Then, we’ll give you our final verdict on which brand to go with for your purposes. 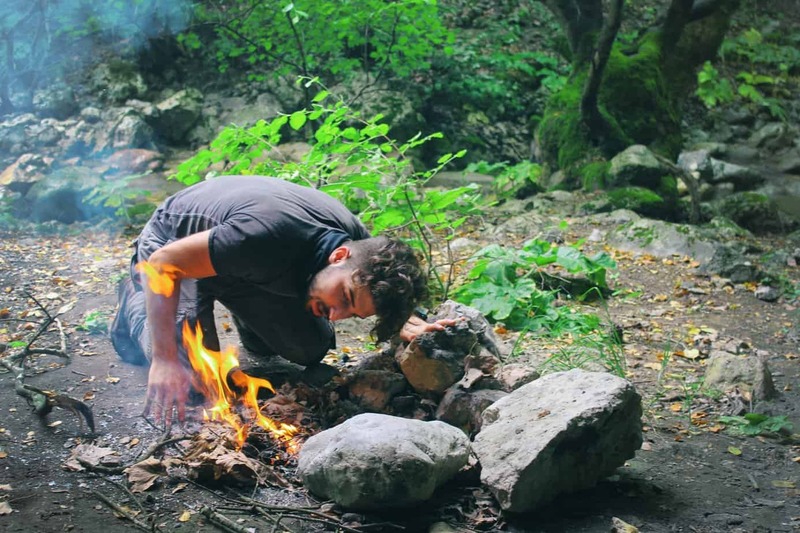 Read about the Best Meals for Backpacking here! 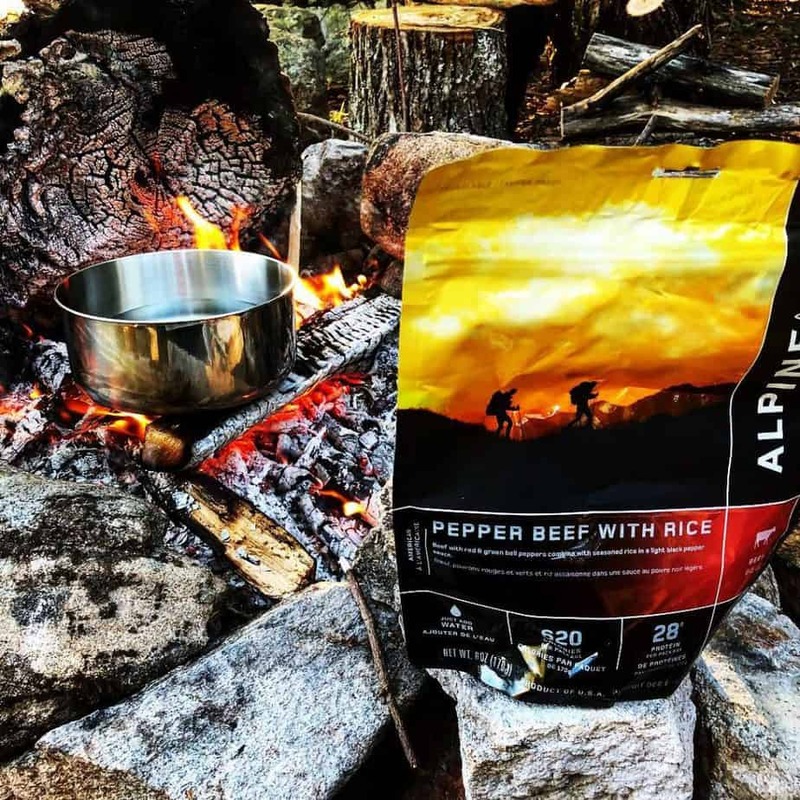 AlpineAire is aimed toward outdoor enthusiasts, hikers specifically, to provide them with tasty, nutritious food that will sustain them throughout their adventure. They look at their offerings as fuel more than simply food. 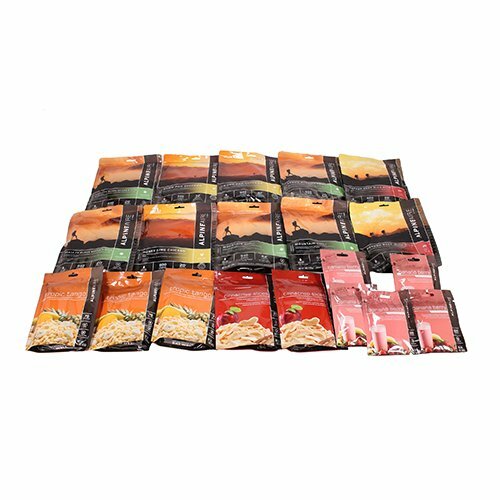 Their freeze dried, dehydrated foods are all-natural, and their selection includes breakfasts, desserts, side dishes, and soups. AlpineAire has been around since its founding in 1979, and in 2012, the Katadyn Group bought AlpineAire, leading them to a rebranding. The Katadyn Group has a portfolio of brands in the nutrition and outdoor niches. Learn more about AlpineAire here. 3- to 7-day meal kits. Blog covering events, interviews, and outdoor tips. Foods come in self-standing pouches. Purchase online through their website. Most of AlpineAire’s pouch foods will last for a minimum of five years, assuming proper storage conditions are met. Proper storage conditions mean putting the items in a cool, dry environment at 65 degrees Fahrenheit or less (cooler is better). Once AlpineAire food has been opened, it should be consumed as soon as possible, but it can last for up to 60 days if it’s covered and stored in a cool, dry environment. AlpineAire’s website doesn’t make it easy to find information about shipping or returns. You’d have to read through the long Terms and Conditions page to find anything out if you could even make sense of it. Their Contact Us page is easy enough to find and it includes a phone number, email address and contact form, though the contact form is lengthy and has a number of required fields. AlpineAire’s biggest bragging rights have to do with their assortment of foods and food types. Also, their relationship with Katadyn makes them part of a greater outdoor group. AlpineAire isn’t as easy to get your hands on as Mountain House products, though, and they haven’t yet made nearly as big a splash as Mountain House has. They also don’t have much of a focus on emergency preparedness. For people who are looking for a certain type of food for dietary reasons above meal type, this is a convenient way to filter AlpineAire products. The meal categories to choose from make sense and mimic the meal categories people think of for their regular at-home meals. AlpineAire has unique foods, especially when compared to Mountain House. For example, AlpineAire’s entrees include pepper beef with rice, spicy pork sausage pasta, and cheese enchilada ranchero. Mountain House’s includes more basic meals and flavors, like chicken and dumplings, beef stew and chili macaroni with beef. The other categories seem to follow suit. For example, AlpineAire’s desserts include Chocolate Mudslide and Toffee Break, while Mountain House has apple crisp and ice cream sandwiches. It’s common for these types of foods to have high levels of sodium, because they’re usually designed specifically for people with a high-performance lifestyle, which means that the foods should replace some of the sodium that a person loses during high levels of exertion. According to AlpineAire’s FAQ page, they’ve greatly lowered the sodium levels in some of their products. When comparing similar entrees between AlpineAire and Mountain House, they have lower sodium levels, too. For example, the sodium in AlpineAire’s Creamy Beef and Noodles with Mushrooms is 650 mg, while the sodium in Mountain House’s Beef Stroganoff is 800 mg. When you go to the AlpineAire website, you’ll be able to click right through to the other Katadyn Group brands, which range from outdoor and travel to water tech, emergency preparedness and military. As you’re shopping on the AlpineAire website, you’ll come across other Katadyn products that you may find useful. While the blog on Mountain House covers basics like building an emergency kit, loading your backpack and which U.S. waterfalls to visit, the AlpineAire blog – which is from parent company Katadyn – covers a lot more. Recent articles include an interview with cyclist Sarah Swallow, tips for practicing sustainability at music festivals, and how to choose and use their many products. While you can buy AlpineAire products in stores like REI, Sam’s Club and Walmart, the AlpineAire website itself don’t have a way to find out where you can buy their products in a store. If you look at the Amazon results for AlpineAire foods, the products that are listed have high reviews, mostly, but very few reviews; also, some products have very low ratings. While AlpineAire does have meal kits, they don’t promote emergency preparedness nearly as strongly as Mountain House does. It looks like they used to create something called Gourmet Reserves for preparedness purposes, but aside from a mention on their website’s FAQ page, these canned products can’t be found on the AlpineAire site. Their foods also have a much shorter shelf life than Mountain House’s. During the Vietnam War, Mountain House’s parent company, OFD Foods, responded to the call to create better tasting and longer lasting food that weighed less than traditional rations. Today, Mountain House still makes food for several branches of the U.S. military. The fact that they’ve been around for so long could be why Mountain House has a wider audience and more brand loyalty than AlpineAire. Learn more about the best Mountain House Meals here! 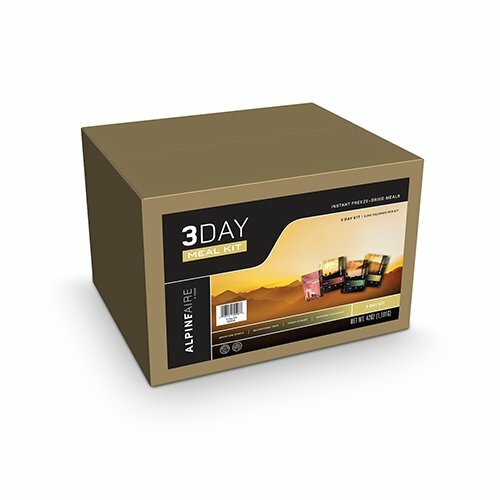 2- to 14-day emergency food supply kits. 30-year shelf life or more. Foods come in self-standing pouches, as well as cans and boxed kits. A lot of your customer support questions can be answered through Mountain House’s FAQ page. There, you’ll find that they offer free shipping on orders of $99 or more. You can also learn about their return policy, which basically says that you can’t return a product unless it’s damaged or defective. You can contact Mountain House through a chat window or their Contact page, which also includes a phone number. Mountain House is available in many stores that you likely have right in your neighborhood, like Walmart. They also have a huge platform of happy customers. 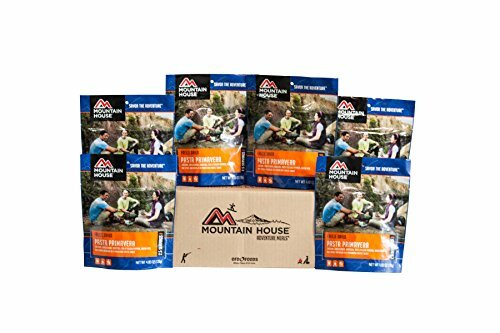 If you need long-lasting food for emergency or survival purposes, Mountain House has several options, as well as advice. The main drawback to Mountain House when compared to AlpineAire lies strictly in food options (however, if you find that Mountain House has tastier foods, then fewer options won’t matter). Mountain House has a Where to Buy page where you can find nearby stores that carry their products. Filter results by zip code and search radius. When you search for Mountain House products on Amazon, you’ll find a number of products that have several hundred reviews at 4 or 5 stars. 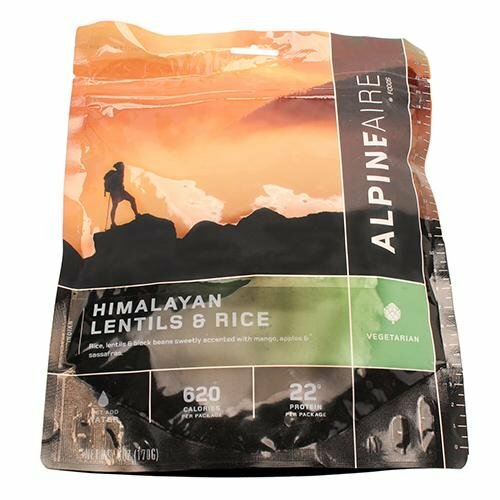 While AlpineAire has food kits that could be used for emergency preparedness, Mountain House puts preparedness at the forefront of their meal kits. They have a page dedicated to emergency preparedness and their kit descriptions are a lot more fleshed out than AlpineAire’s. Filters for dietary options are limited. Once you’re in a meal category, like breakfast, you can sort by dietary options, but they only include beef, egg, pork, vegetarian and an “other” category. 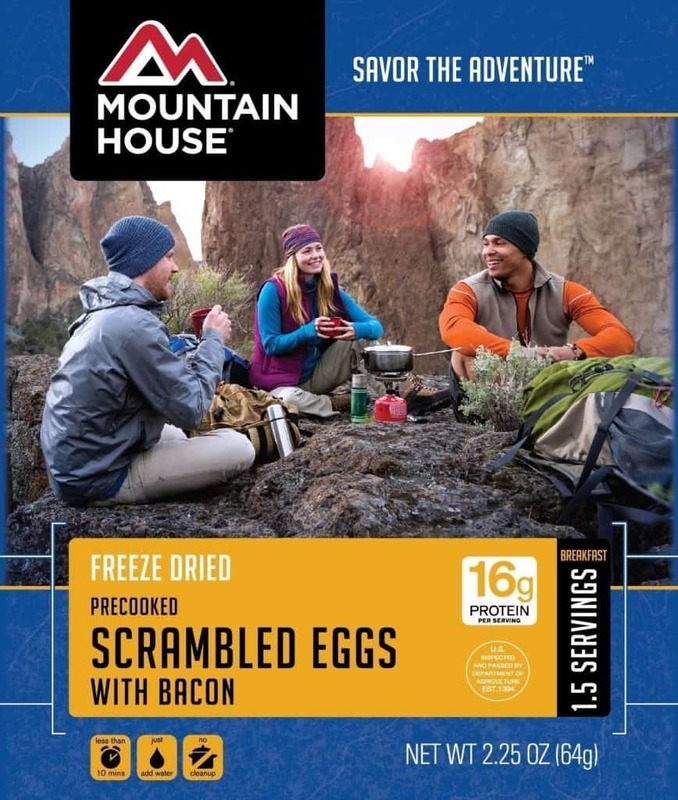 Mountain House has some of the same sensical meal categories as AlpineAire, like breakfast and dessert, but their “sides” category doesn’t make as much sense – it’s labeled “Freeze Dried Meats and Sides,” which is an odd grouping, and there’s a limited selection that includes crackers, diced meats and gravy. Read here Backpacker’s Pantry vs Mountain House! Though they have similar offerings, especially for backpacking and hiking (Mountain House caters more than AlpineAire to people interested in emergency preparedness), Mountain House seems to be the standard. Part of this could be due to availability – it’s easier to find Mountain House products in stores, and it’s also much easier to figure out where those stores are thanks to their Where to Buy guide. When it comes to flavors and meals, AlpineAire’s has more “gourmet” options than Mountain House. That doesn’t mean that Mountain House doesn’t have a somewhat wide selection of foods to choose from, but for people who have been loyal to Mountain House for years, trying out some AlpineAire products could be a good way to add some variety. However, taste plays a big role in which brand you’ll end up sticking with – more flavors doesn’t mean much if their foods don’t taste as good as another brand’s. Outdoor enthusiasts could bring along selections from both brands on their next trip, assuming they can either order or find the foods in-store on time, in order to compare taste. Don’t be too wooed by Amazon’s higher number of reviews for Mountain House. AlpineAire hasn’t been around nearly as long, and they underwent a big rebranding in recent years. Newcomers may have less reach, but that doesn’t mean anything about the quality of their product. Also, if sodium is a concern, or if you want options for different types of lifestyles (like vegetarian or gluten-free), AlpineAire has a bigger and easier-to-sort selection for these purposes. 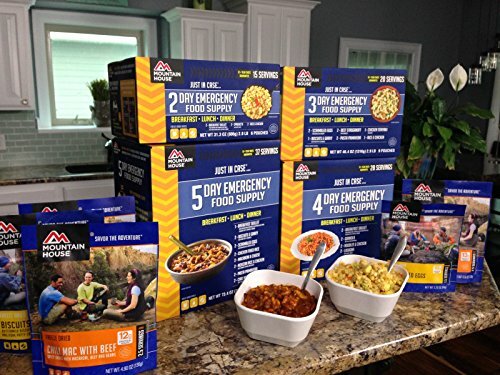 If you’re looking for emergency or survival tools, go with Mountain House – their foods last longer and they have kits that are specifically designed for emergency prepping.